The Presidential Fight is heating up in the Swing states like Florida, Pennsylvania and Virginia. Experts are coming up with their own predictions and analysis. The other day i was on the Wall Street Journal website checking out the headlines. Like all other Xcelsius users, my attention was drawn to a nice looking graphic of the USA map. Eventually it turned out to be the 2008 Electoral Calculator. 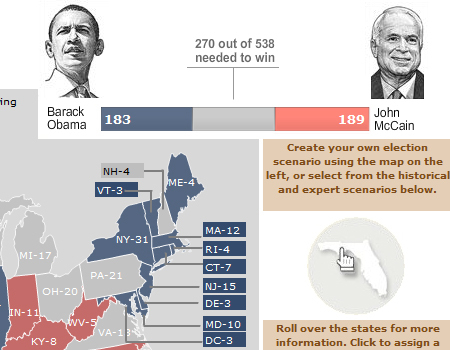 Its an interactive calculator which can be used to build your own scenario of who is going to win what states. The immediate thought that came to my mind was “Can i make a similar Calculator with Xcelsius 2008”. I thought of giving it a try and here is what i came up with. This is a brief description about how i built it. Many Xcelsius developers should be able to understand. As you can see i used the USA Map component and i carefully placed the icon components over each state (Tedious work Phew…). The reason for the icons was to allow the user to click on a state and insert the relevant value in the cell corresponding to the State. I set Alerts for the states so that they display Red or Blue depending on the value inserted by the icon. The rest of the calculator is simple label components and other basic Xcelsius stuff. Most of the time was spent on the overall look and feel of the calculator. Posted in: Dashboards, Examples, FCS, Other, Xcelsius 2008. Xcelsius uses MS Excel as a base to create Interactive Dashboards. Xcelsius does not support all the functions available in MS Excel. I have put together the list of MS Excel functions that are supported by Xcelsius 2008. This list can also be found in Xcelsius User’s Guide. Following is the List. Posted in: MS Excel, Xcelsius 2008. Does Crystal Xcelsius support Excel pivot tables? No, currently, Crystal Xcelsius does not allow Xcelsius-generated .SWF (Shockwave Flash) files to have pivot table functionality. Xcelsius does allow you to import Microsoft Excel files that have pivot table data and use that data. For example, you can import an Excel workbook that has pivot tables and use a Table Selector component to visualize the range of cells that is the output of the pivot table. Xcelsius can then display the output of a pivot table, however it cannot recalculate. Currently, Xcelsius does not support the function GETPIVOTDATA. Posted in: Articles, MS Excel. MarkLogic Performance Dashboard is one of the featured dashboards on Xcelsius Xchange. The below description is straight from Xcelsius Xchange website. I found it very interesting so thought of sharing with you all. Mark Logic Corporation is a Technology Partner of Business Objects, An SAP Company. Mark Logic uses Xcelsius to create interactive performance dashboards leveraging its strong visualization capabilities. These visualization capabilities provide administrators with a succinct performance overview of a MarkLogic Server cluster. From there, an administrator can zero in on any performance related issues quickly and easily. Additionally, Xcelsius’ XML capabilities facilitated rapid integration with MarkLogic. These capabilities also enable creation of Xcelsius generated dashboards that provide insight into content stored in MarkLogic in an intuitive and easy to use fashion and enhance the existing administrative interfaces available with the product. This download (and other open source MarkLogic downloads) is also available at the MarkLogic Developer website. Mark Logic Corporation is a leading provider of information access and delivery solutions used by publishers, government agencies, and other large enterprises. The company’s flagship product, MarkLogic Server, is an XML content platform that includes a unique set of capabilities to store, aggregate, enrich, search, navigate, and dynamically deliver content. To learn more about Mark Logic, or to download a free community edition of MarkLogic Server, go to the MarkLogic website. Posted in: Dashboard of the Week, Dashboards, Xcelsius 4.5. Xcelsius keycode is missing or expired! The keycode you entered in not valid. Please try again. This error is caused because the user who is trying to launch the application has no permission to write to the registry. Interestingly the person who posted this question posted the answer too. Below are the 2 solutions that he had found to fix this issue. After installing the software, run Xcelsius once under the administrative user who installed the software. This user will be prompted to enter the keycode and has permissions to write the keycode to the registry. Non-administrators can read the registry key and run Xcelsius. Logon to the machine with administrator rights. Right click on Suite 12.0 and choose Permissions. Grant Full Control to the Users group for this key. Non-administrators can now write to the key and enter the keycode themselves. Posted in: Errors, Xcelsius 2008.